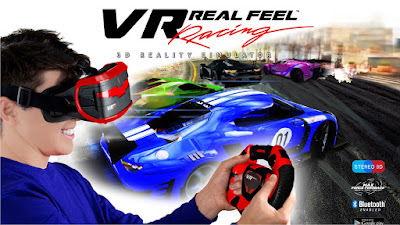 VR Real Feel Racing is the only virtual reality gaming system that gives you control with a real steering wheel. Accelerate, brake and steer with Max Force Feedback to feel the vibrations in the steering wheel when you bump other racers or the wall! 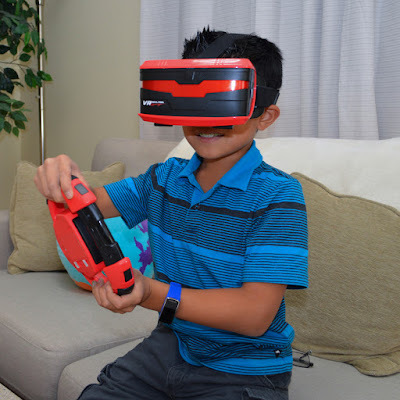 While other VR driving games may use head tilts to control the action, VR Real Feel™ Racing provides a far more intuitive driving system through the steering wheel. Featuring a 42mm lens headset that harnesses the power of Apple or Android™ smartphones to deliver pixel-popping graphics in stereo 3D and a patented Bluetooth™ steering wheel with Max Force Feedback™, players can steer, accelerate, brake and change the view with the steering wheel. VR Real Feel Virtual Reality Car Racing Gaming System with Bluetooth Steering Wheel and Headset Goggles Viewer Glasses for iOS iPhone and Android. Patented Bluetooth Max Force steering wheel to steer, accelerate and brake for ultimate control! Unlike other VR headsets, no more tilting head to turn - this is the way virtual reality racing was meant to be! My grandson says his favourite is the Bloodhound SSC. Not quite a racing car ( i like the old fahioned porsche), but my son's faviorite is a Land Rover Discovery. We like Aston Martins in our house. British racing green! My favourite is a Lamborghini. My boyfriend is always going on about a Subaru Impreza he used to own, so I'd say that. Ferrari and it has to be red! My partner's favourite is the Aeriel Atom, he had a go at driving one last month! My 5 year old daughter's favourite car, is 'The Little Red Racing Car', from the book! Love the classic Subaru Impreza Rally car! She's only young so says red ferraris at the moment! My son says lightning McQueen lol! My partner's favourite is the Land Rover. My husband and I love F1 and Formula e, so I would say a Ferrari is my favourite car. But I'm a Max Verstappen fan, so a Red Bull is great too. Broom broom that's for me! Any F1 cars are favourite in our house, it used to be Roary but we are over it now! Perhaps not quite a racing car but am I allowed to say a Capri or an Aston Martin Vanquish???? My son loves a Ferrari!